Fast Measurement – Neck finish measurements in seconds. Mobile – Designed for mobility within the plant or between facilities. Simple Setup – “CAD” based initial setup using a live image of the product. Low Cost – Less expensive than a fully automated measurement systems. Versatile – Varied uses in the plant environment. 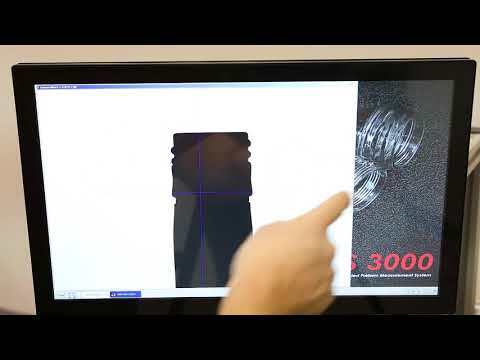 Automated video dimensional measurement system for bottles and preforms (basic capability). QUIKCHEK was designed as a basic “stripped-down” version of the AVBIS 3000 series for those manufacturers requiring simple precision measurement tools for plant operations. Intra-plant – On a shop cart for use during mold setup or maintenance at the molding machine. Inter-plant – Use an optional hard case to ship between plants for mold qualifications or trials. Fixed workstation – Place at a floor workstation for random sampling. Vendor qualification – Send to tool makers to qualify new molds before they arrive on your dock. Filler audit – Use as an incoming inspection tool to inspect supplier quality. Supplemental – Place in the lab as a secondary measurement/verification tool. The lower cost of QUIKCHEK also makes the system attractive to those smaller facilities looking to enhance their measurement capabilities, but do not require the automation of the AVBIS 3000 series. Smart servo controlled vertical and rotational axes. AVBIS interface; no training required for facilities with AVBIS 3000 series. Complete program compatibility with AVBIS, AVBIS codes can be transferred to QUIKCHEK and used immediately. With optional verification objects, third party calibration not required. Optional re-useable shipping case for inter-plant applications.